A captivating new movie about canine amputation showcases the recovery stories of dogs of all ages who lost a leg to improve their quality of life. Let’s give three paws up to Dr. Chris McReynolds, the staff and patients of Southern Colorado Veterinary Internal Medicine for this excellent video about three legged dogs! If you’ve just received the scary news that your dog’s leg needs to be amputated, please take the time to watch this video. 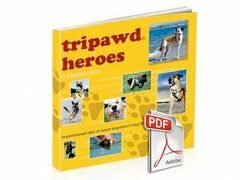 We are so impressed that a busy veterinary practice took the time to share the facts about tripod dogs. And it’s also an incredible honor that Dr. Reynolds gives a shout out to the Tripawds community at the end of the video! We’ve never met the good doctor and his compliment came as a complete surprise. 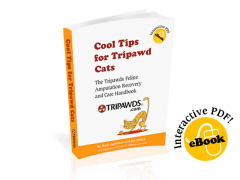 You can be sure that we’ll try interview him for the Tripawds community! Many thanks to everyone at Southern Colorado Veterinary Internal Medicine! If you live in this corner of the world and need an excellent veterinary team, be sure to make an appointment at this five-star practice. Thank you all for giving me my dogs for a while longer. Hobbs and Hattie thank you too! Anyone in this situation should watch this video. It will help! You’re so welcome Sue. Hobbs and Hattie are truly inspawrational. Don’t be a stranger!